I have just listened to a programme on BBC Radio called "The Kitchen Cabinet", it was dedicated to the New Forest. I should really make an effort to listen more often because as well as loads of food history, you hear from local experts notably food producers and chefs. Now, I did know a bit about the New Forest. I have camped there for one. In a very rudimentary Forestry Commission campsite as I recall with one loo and one tap. Unfortunately on sloping land! I am sure it is either closed or has been "glammed" up by now. I do recall the lack of facilities meant we had to wash in a brown, brackish stream in the forest.....we only camp in hot weather. The abundant foxgloves afforded us some modesty! As far as I know there were no quadrupeds watching us, but on our rambles we did bump into horses, cattle, sheep and pigs. Back then I am not sure there were wild boar in the forest, but there are escaped specimens estimated at several hundreds today. I have shared a stall with my sister at a dollshouse fair at Lyndhurst in the New Forest too! And since I model boars' heads I had to "bone up" on Medieval forest practice, so as to provide an accurate context for a boar head at the feast. The radio programme reminded me that the New Forest is England's oldest, having been declared a royal hunting chase or forest by William Duke of Normandy, aka William the Conqueror, in 1079. It is the only forest where the ancient peasant right of pannage remains - for a levy you bought or buy the right for your livestock to forage for food, notably mast - acorns and beech nuts. 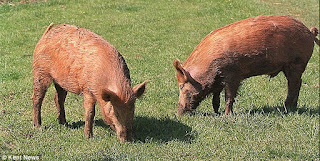 In September at the start of the acorn season the pigs and wild boar, and today's hybrid breeds such as the Tamworth pig, come into their own. The digestive systems of horses, cattle and sheep do not benefit from grazing on acorns, so out porcine friends are positively encourage to hoover them up. Do acorns contain arsenic or similar I wonder? 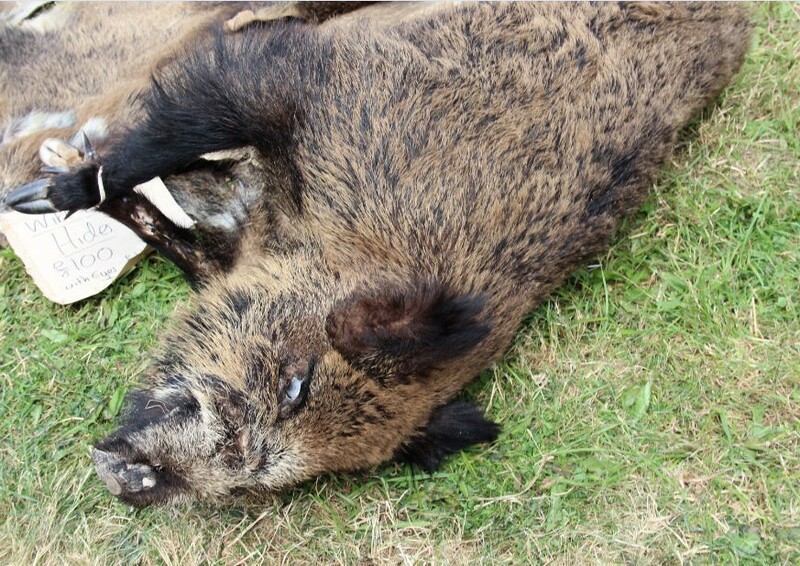 We also heard that in Victorian times a boar's head would be singed of hair and bristles, soaked in brine for two weeks then roasted. Next it was "pimped" with the obligatory apple in it's jaw, artistically arranged port wine jelly, a piped family crest, and leaves or even garlands. Really, it sounds as if no-one wanted to eat the thing. And perhaps the dish was little better in Medieval times? 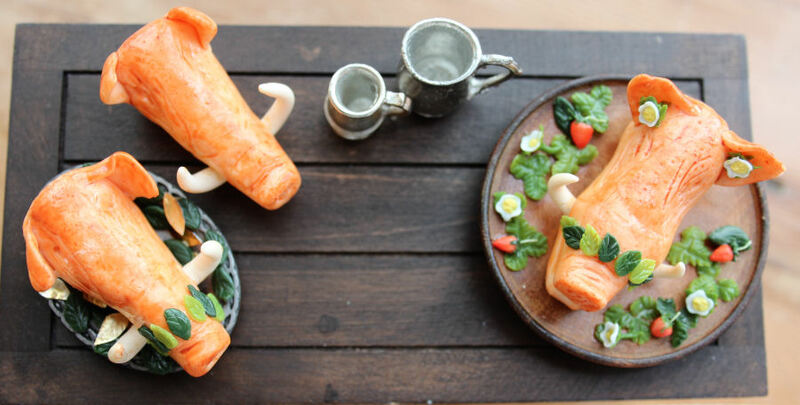 Certainly boars heads, a dish reserved for the nobility, were glammed up in Medieval and Tudor kitchens too. Well I certainly had fun pimping mine, as you can see! 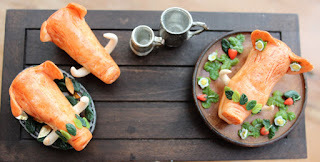 MedievalMorsels' pimped boar's head a la Medieval feast, Victorian dining! A relic of the mast system still survives in Spain today where black and red Iberian swine feed in oak woodland on the Sierra Morena, producing a delicious, sweet, melt in your mouth dry-cured ham called jamon iberico. Now we are talking ham!